Crossing the Floor is a term used in British politics to refer to one of two kinds of allegiance shifts by Members of Parliament – either voting against the majority of one’s party delegation on a given parliamentary vote (analogous to the American cliché “crossing the aisle”) or switching party affiliation entirely. American political pundits have no similar idiom to describe party switching, even though party switching is fairly common in contemporary political culture. Such prominent GOP figures as Ronald Reagan, Strom Thurmond, Trent Lott, Condoleezza Rice, and Georgia’s two most recent governors, Nathan Deal and Sonny Perdue, began their careers as Democrats, while two of the most popular liberal figures of the past decade, Hillary Clinton and Howard Dean, started out as Republican activists. The most pronounced wave of party switching (or, as they say in Westminster, “floor-crossing”) in American history has occurred over the course of several generations here in the Deep South. Once the most loyally Democratic region in the country, the “Solid South” would typically deliver lopsided margins of 70-30, 80-20, or more – in South Carolina it was expected for Democratic presidential nominees to receive 95-98% of the vote – from the late 1870s until the Civil Rights Movement came of age in the 1950s. Democrats dominated state legislatures and congressional delegations in the South well beyond the movement’s heyday, even into the 1990s. Only in the past decade have Republicans broken century-plus Democratic monopolies in state legislatures in Alabama, Georgia, Louisiana, Mississippi, Oklahoma, Tennessee, and Texas, while Democratic majorities remain in such seemingly unlikely spots as Arkansas and West Virginia. The Republican Party ascended in Georgia politics quite slowly and, indeed, later than in many southern states. Georgia elected its first Republican U.S. Senator in modern history, Mack Mattingly, in 1980, well after GOP Senate candidates saw success in Florida, Mississippi, the Carolinas, Tennessee, Texas, and Virginia; and the state would not reelect a Republican to the U.S. Senate until Paul Coverdell in 1998. In 1990, the Democrats held stunning majorities of 45-11 in the State Senate and 145-35 in the State House, 26 years after Barry Goldwater became the first Republican presidential candidate ever to win the Peach State and still 12 years before Republicans would claim the state’s governorship and majorities in its legislature for the first time since 1872. But there were signs of fission within the state Democratic Party as early as the 1960s. In 1964, Howard “Bo” Callaway (see our post about the gubernatorial election of 1966) switched his party registration to Republican en route to becoming the GOP’s first U.S. Congressman from Georgia since Reconstruction and, two years later, the first Republican nominee for Governor in 90 years. Amid these turbulent electoral happenings at home, Georgia Democrats attempted to make contrasts with a national party increasingly ambitious to advance its civil rights agenda in Washington. 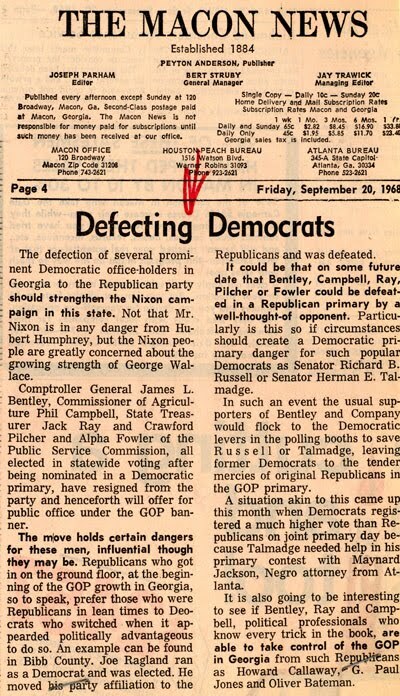 It was in this context that five prominent Democrats – Public Service Commissioners Crawford Pilcher and Alpha Fowler, State Treasurer Jack Ray, Agriculture Commissioner Phil Campbell, and Comptroller General Jimmy Bentley – jointly announced in 1968 that they were becoming Republicans, citing the frenzied Democratic National Convention in Chicago and national disunity. Bentley had already warned U.S. Senator Herman Talmadge, a personal friend and former boss, who claimed in a 1975 interview to have “spent about an hour trying to dissuade him.” Bentley would run for Governor in Georgia’s first-ever statewide Republican primary in 1970, but lost the nomination to Hal Suit, whom Jimmy Carter defeated handily the following November. Above: a Clifford Baldowski political cartoon published in the Atlanta Constitution on October 2, 1968. 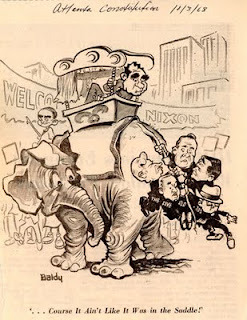 It depicts the five party switchers clinging to the tail of Richard Nixon's elephant. Captioned "Course it ain't like it was in the saddle" gives a nod to their precarious position after becoming part of the GOP. John J. Flynt Papers, Russell Library. The other four party-switchers also faded away from electoral politics in short order. Campbell resigned in 1969 to become a U.S. Undersecretary of Agriculture in the Nixon White House. Governor Maddox appointed Democrat Tommy Irvin to replace him. Fowler retired from the Public Service Commission in 1970, followed by Pilcher in 1972. Ray ran for reelection as Treasurer in 1970 and lost by a 66-34% margin to Democrat Bill Burson. Though these five men did not last long as Republican elected officials in single-party Georgia, in the years following their defections from Democratic ranks GOP candidates began to surface on statewide ballots, occasionally running competitive races down-ballot as well as for the big prizes of Governor and U.S. Senate. 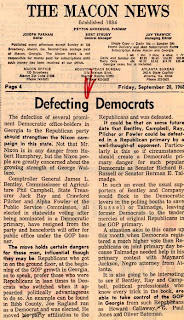 The party-switchers of 1968, combined with Callaway’s near miss two years prior, encouraged many Georgia politicians to “come out” publicly as Republicans and begin a quarter-century process of party organizing that, ultimately, would bring them to the dominant position statewide they currently enjoy over the once-reigning Democrats. Note: Clippings used in this post are scans from the John J. Flynt Papers at the Richard B. Russell Library for Political Research and Studies. To find out more about the Flynt Papers, visit our online finding aid for the collection, or email russlib@uga.edu.